View from the beachfront balcony. Incredible views from all common areas Spacious penthouse completely furnished. Perfect space for entertaining. Furniture designed by a prestigious designer and custom made in Costa Rica. Large dinning room for guest and family to gather around. Bi-Level entertainment area to maximize the view. Breakfast bar. Fully equipped kitchen. Informal dinning area in addition to the formal dinning table. Stairway into the game room. Office area. View from the game room. Game room. Shuffleboard View into the game room. Bar area. Tv area. Half bathroom for common areas. Master bedroom. Master tub with a view. Master bathroom. Balcony outside master suite. Secondary bedroom. Mountain view from the secondary bedroom. En suite bathroom in the secondary bedroom. Ensuite bathroom on secondary bedroom. Ensuite bathroom on secondary bedroom. Third bedrom. Ensuite bathroom for the third bedroom. View from third bedroom balcony. View from balcony. Forth bedroom outside the game room. Forth bedroom. Balcony outside forth bedroom. Bathroom outside forth bedroom and game room. Outside dinning area. Lost Beach Diamante del Sol. 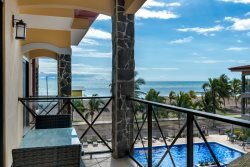 Luxurious oceanside pool Diamante del Sol Diamante del Sol with north view of Jaco. Diamante del Sol with south view of Jaco. This magnificent top floor Penthouse is located in one of the most luxurious beachfront communities in Jaco Bech, Costa Rica. The 8th floor penthouse comes fully furnished and has 4,105 square feet sprawling 4 bedroom, 4.5 bathroom. The property is completely outfitted with modern design, luxury finishes and Costa Rican inspired artwork. This immaculate 8th floor fully furnished, 4,105 sq foot sprawling 4 bedroom, 4.5 bathroom top floor penthouse unit is completely outfitted with modern design, luxury finishes and Costa Rican inspired artwork. Enjoy full panoramic ocean views on your private wrap around balcony that faces the ocean and affords stunning sunsets. The main living area features floor to ceiling windows, comfy leather couches, a flat screen TV with full cable, and free WI-FI access. Enjoy preparing meals in your fully equipped modern kitchen with stainless steel appliances, granite counter tops and breakfast bar. Experience sunset dinners in the dining room while watching the crashing waves that lap the coast line. Enjoy the loft area with shuffle board and full board for entertaining. Every bedroom is equipped with a private in suite bathroom and balcony with an ocean view or view of mountains. The master bedroom has a king size bed with a flat screen TV, safe, and glass doors that lead out to the main balcony. The second bedroom and third bedroom are outfitted with queen size beds. The 4th bedroom has 2 sets of bunk beds that are great for friends or family. There is a laundry room with full size washer and dryer to keep you and your family fresh and ready for the next adventure.